SuperSizer MBC is a “high precision multiple band compressor” specially designed for mastering stereo tracks. It comes with six “SuperSizer” stages and five “high-end phase-shifting-free” and “resonance-free” bandpass filters designed with StarPlugs’ pd quantum-filter technology. 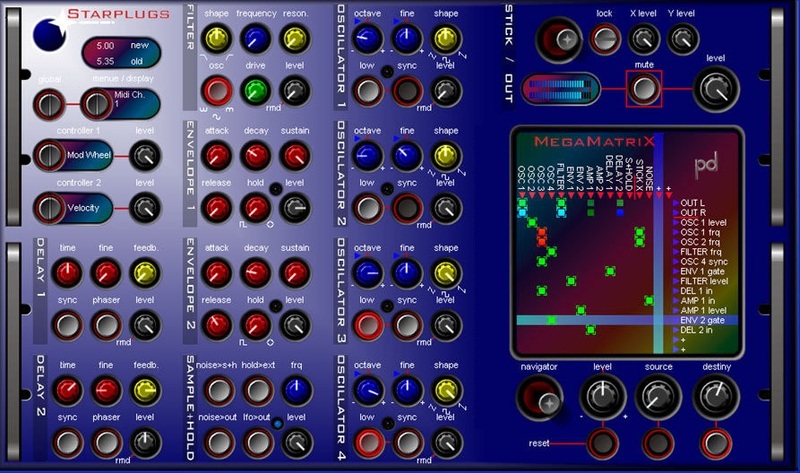 SuperSizer MBC divides the input signal into five frequency bands that can be attenuated and supersized independently. The five frequency bands are then mixed and sent to an extra “MasterSuperSizer” stage. The Starplugs Cyclone-Phaser is a double stage 5.1 phaser. The phasing effect will rotate in your complete surround bus, group or master section. You are able to set different rotation- and phasing-styles for each phaser-stage. The Starplugs Cyclone-Pan is designed to auto-rotate a stereo or mono signal in a 5.1 group, bus or master. Your are able to set different rotation types and syncs for your left and right input-channel. Let your loops go round and round and round ………. The Starplugs Vocoder uses 32 of “pds quantumfilter” to create two banks of high quality analysis- and synthesis-filters. It includes special functions like pitch shifting and consonant support, to help deliver voices that are distinct and clear, plus a 16×16 (256) modulation matrix to give you a wide range of modulation possibilities. Cyclone Delay is a MIDI clock-synced 5.1 rotation delay. The delays of each 5.1 (beside LFE) input-channel will rotate in your complete surround bus, group or master section. You are able to set different rotation- and delay-styles. The rotation speed of the delay-signal is set by the sync–selector. Bar measures are MIDI clock-synced values. The rotation starts and stops with start and stop playing and the rotation-point resets on stop command. Beside left and right circle-turn you have the choice of different cross- and random-jumping-modes for your delay-signal.